You should be grilling flanken-style short ribs this summer: They’re an affordable, quick-cooking weeknight dinner option. 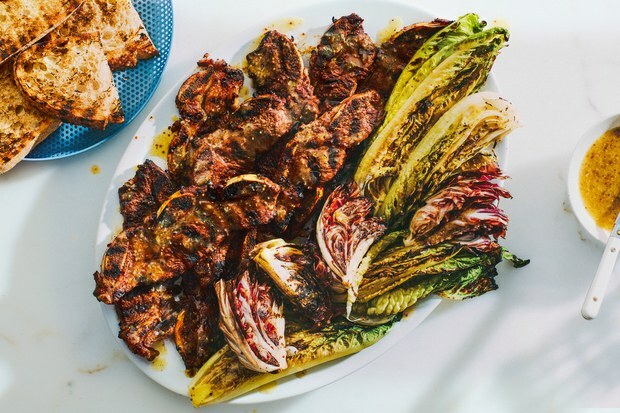 The ribs benefit from a bittersweet and mustardy orange marmalade marinade, and those flavors reappear as a dressing on grilled romaine and radicchio. It’s a completely new spin on steak and salad—and perfect for a family feast. Stir red pepper flakes (if using), 1/2 cup marmalade, 2 Tbsp. mustard, 1 Tbsp. vinegar, and 1/2 tsp. black pepper in a small bowl. Place ribs in a glass baking dish; season all over with 2 tsp. salt. Pour marinade over and turn ribs to coat. Let sit at room temperature at least 15 minutes and up to 1 hour. Whisk garlic, 1/4 cup plus 2 Tbsp. oil, 1/2 tsp. salt, 1/2 tsp. pepper, and remaining 1 tsp. marmalade, 2 tsp. mustard, and 2 Tbsp. vinegar in a small bowl or measuring cup. Prepare a grill for high heat; oil grate. Grill ribs until lightly charred and crisp around the edges, about 2 minutes per side. Transfer to a platter, season with salt, and let rest 5 minutes. Drizzle cut sides of romaine and radicchio with oil, then season with 1 tsp. salt. Grill, turning occasionally, until lightly charred and warmed through, about 2 minutes for the romaine and 5 minutes for the radicchio. If using bread, grill alongside radicchio until lightly charred and warmed through, about 2 minutes per side. Transfer to platter with ribs. Pour dressing over charred lettuces and ribs; season with more salt and pepper. Do Ahead: Marinade and dressing can be made 1 day ahead. Cover and chill. Ribs can be marinated 8 hours ahead. Cover and chill then let sit at room temperature at least 15 minutes and up to 1 hour before grilling.